Have you ever stepped into a famous patisserie and told yourself.... "This place is supposedly amazing cause' everyone said so about their macarons" ? Have you ever stared into the window display and told yourself... "Oh the chocolate macarons must be good cause' its been crowned their signature"? Have you ever bought 2 macarons, looked at them and told yourself... "Ahh these MUST be good cause' its their signature AND everyone else said its amazing"? Have you ever pushed your expectations sky high, unwrapped the macaron, cautiously took a bite then find yourself raising your eyelids and go... "Mmmmm NOW I GET IT." The Pistachio Chocolate Macaron. Oooooh to that fine crust cracking with a less than an inch of a touch. 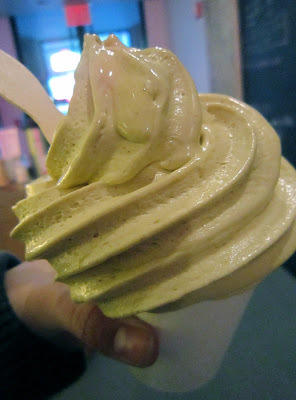 Ahhhhh to that moist shell innards that released quality pistachio (paste) fragrance and a perfect chewing consistency. Ooooomph to that premium chocolate ganache that's silky delicate yet robust in cocoa percent. 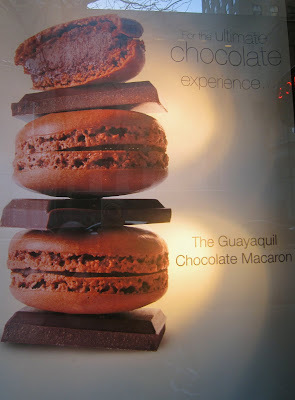 The Guayaquil Chocolate Macaron was same ultimate goodness, double the chocolate experience. US$2.50 for each tiny tot sized but monstrous levels of macachoco-tisfaction. My macaron soul was sold. To La Maison du Chocolat. 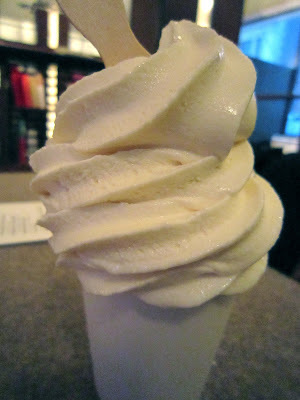 David Chang is a genius when it comes to softserve flavors. Donut, Gingerbread, Red Velvet Cake....he's tried all the yummy dessert inspirations, even breakfast. Down at the Midtown West store, i experienced love at first taste with one of them. You have to agree this idea is brilliant. 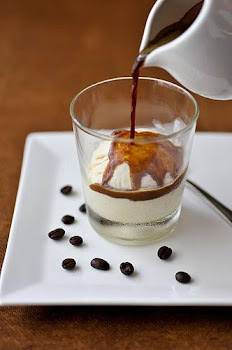 Just as Milk flavor is flooding the softserve scene, he adds a breakfast touch & made it magical. Like a wand sending gold dust all over. Amidst the creamy milk base inhibits a million tiny cereal crunchies so harmoniously blended in... the smooth finishing is remarkable. I can have this for breakfast too. Hits-and-misses still occur. What didn't go well was the Salty Pistachio Caramel. It's warned you. If the flavor doesn't already sound overwhelming, take a lick. Your brain will freeze in its attempt to process piercing saltiness+ uncontrolled caramel+ pistachio oils (hardly discernible). Then compute o_v_e_r_w_h_e_l_m_i_n_g. Maybe they had a bad-mixture day. Or maybe my tastebuds went faulty for a moment, but i certainly won't approve this havoc love triangle. Mid-cup was surrender point. Go to Milk Bar, and go Cereal Milk it is. It was a pleasure spending the Christmas & New Year holidays at my Granduncle's in Vancouver. My first 2 months of school felt more college than culinary school. We attend a series of theory classes before hitting the kitchens so that means: all i've held so far is paper & pens. When i was asked to make dinner, i jumped at the chance. One thing i enjoy about cooking overseas is the access to many wonderful ingredients. In my Product Knowledge class i learnt a horde about produce i've never spotted in Singapore, and right here in Canada my eyes can physically feast on them. 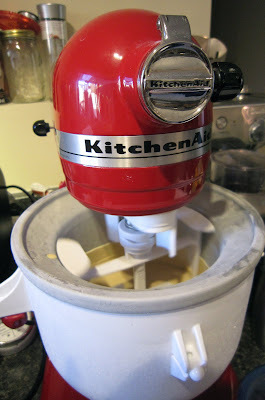 Using his Kitchen Aid icecream-mixer extension (a pretty cool gadget i'll love to have), i finally departed from hand-whisked icecream. 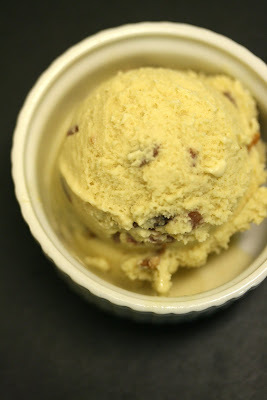 I made a Candied Bacon Ice Cream that satisfied myself. The creaminess & texture was closest to commercial i've ever gotten... and it's base exudes a deep caramelized flavor entwining savory-sweet notes from the candied bacon. Bacon needs no further description mmmm. 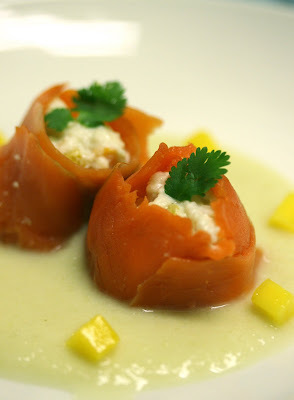 Handpicked blue-swimmer crabmeat is made into a creamy salad with colorful sweet peppers and enrobed in smoked sockeye salmon. 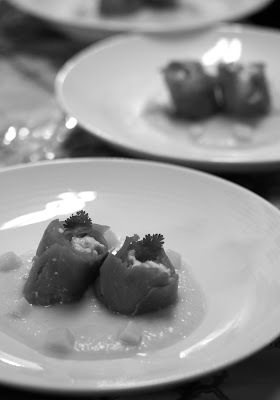 To balance the richness, it is placed over chilled cucumber vichyssoise and fresh mango cubes. This is now one of my favorite compilations. 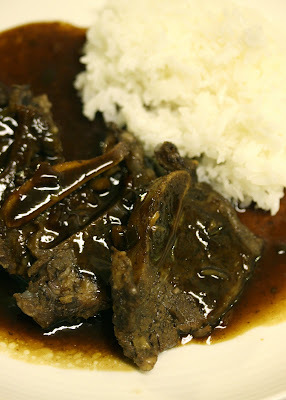 Tapping back on oriental roots, I did an asian-style braised short ribs served with steamed rice. Glimpses of crushed garlic, ginger, lemongrass, green onion bottoms, crushed red peppers & many more enter a braising liquid that immersed the meat for 3 slow hours in the oven. Once tender, the liquid is extracted and reduced into a tasty hoisin glaze. Consider my first dessert of 2011 one of those ideas-gone-wild. Say goodbye to bread, hello to pancakes joining the pudding family. Into my Pancake-&-butter pudding i added frozen blueberries & chopped walnuts and baked the traditional B&B way. A drizzle of maple sauce, maple-glazed walnuts and candied bacon ice cream completes the breakfast platter. Now this is the real breakfast i made in Vancouver. 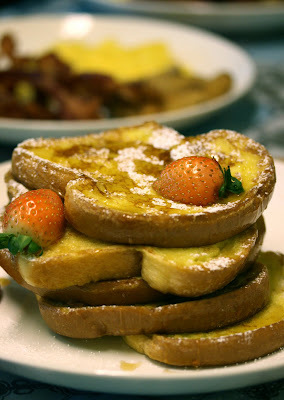 Good ol' French Toasts. Cooking is my #2 therapy, right after eating. 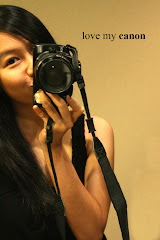 sorry for the yellowish photos, there's no Adobe Photoshop/proper white balance gadgets here with me in NY! and my SLR's been completely idling away... it really has. Elaine writes in direct relation to her tastebuds. I may rave, i may rant, I speak my mind. No responsibilities shall be taken for any personal dining dissatisfactions, or contrasting experiences at the mentioned establishments.